"MEO" redirects here. For other uses, see MEO (disambiguation). Medium Earth orbit (MEO), sometimes called intermediate circular orbit (ICO), is the region of space around Earth above low Earth orbit (altitude of 2,000 km (1,243 mi) above sea level) and below geosynchronous orbit (altitude of 35,786 km (22,236 mi) above sea level). The orbit is home to a number of artificial satellites – the most common uses include navigation, communication, and geodetic/space environment science. 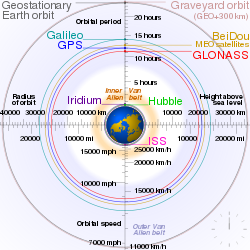 The most common altitude is approximately 20,200 kilometres (12,552 mi)), which yields an orbital period of 12 hours, as used, for example, by the Global Positioning System (GPS). Other satellites in medium Earth orbit include Glonass (with an altitude of 19,100 kilometres (11,900 mi)) and Galileo (with an altitude of 23,222 kilometres (14,429 mi)) constellations. Communications satellites that cover the North and South Pole are also put in MEO. The orbital periods of MEO satellites range from about 2 to nearly 24 hours. Telstar 1, an experimental satellite launched in 1962, orbited in MEO. ^ a b c d "Definitions of geocentric orbits from the Goddard Space Flight Center". User support guide: platforms. NASA Goddard Space Flight Center. Archived from the original on May 27, 2010. Retrieved 2012-07-08. ^ "The Global Navigation System GLONASS: Development and Usage in the 21st Century". 34th Annual Precise Time and Time Interval (PTTI) Meeting. 2002. Retrieved 28 February 2019. This page was last edited on 28 February 2019, at 19:56 (UTC).